Because Santa Claus came to our house today! We had been looking for a way to take Nathan to see Santa this year but wanted it to be in a low key setting. Taking him to the mall or somewhere like that is almost impossible due to all the sensory issues. 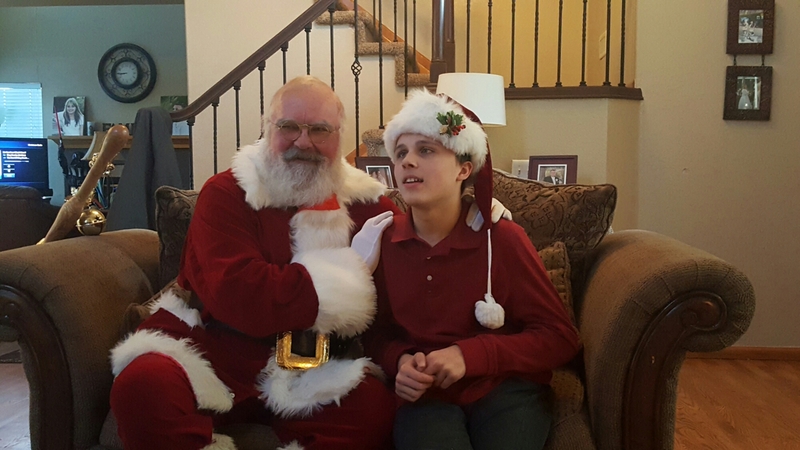 Over the weekend a dear friend of ours contacted me and said she wanted to have Santa come visit Nathan at our house! It was the perfect setting for him to visit with him as he is comfortable at home. It was an offer we couldn’t refuse. We sat in the front room and heard a loud jingling noise. They were loud bells that Nathan heard through the front door. He went to open the door and was so excited to hear Santa. He came in and talked with Nathan for a very long time. 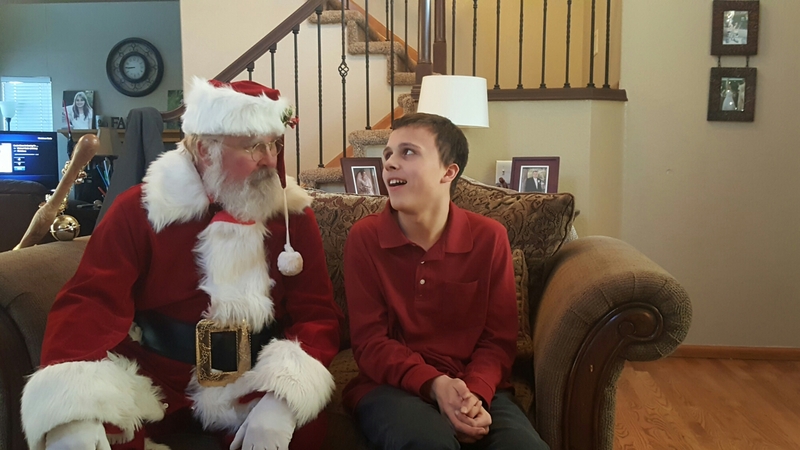 Nathan told him about how much he loved Star Wars and all the things he wanted for Christmas. 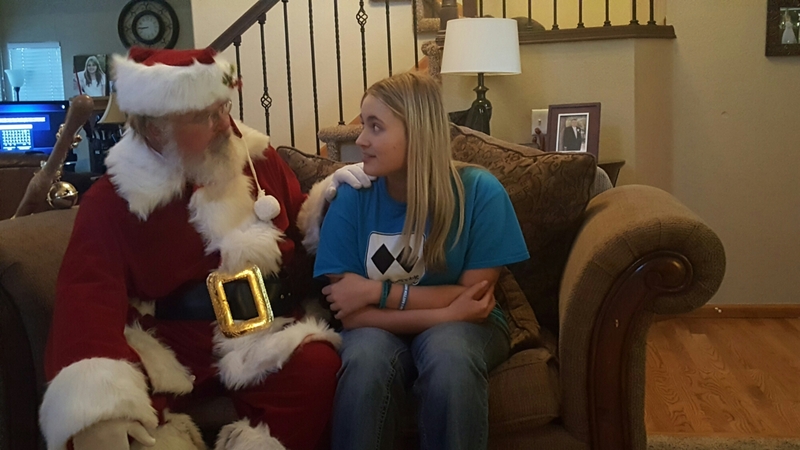 He has not been to see Santa since he was 4, and he was having a hard time remembering his list. Nathan tells us something new everyday that he wants and I think it was hard on the spot to remember everything. He just kept saying “I want something I have never had”. He felt Santa’s beard and buckle and gloves. They talked about his Reindeer and his elves. Nathan asked Santa where something was and he replied in his truck. You could see the wheels turning in Nathan’s head and quickly said, you have a truck? Santa was quick and said “Have you ever heard of Uber?”. It was really funny. He took the time to sit with Madison. I was not able to hear the whole conversation, but I did hear him tell her he understood how difficult it is for her and that she is never alone. Madison told me afterwards how much it meant to her and how much she enjoyed it. He brought each of the kids a gift tailored to them. A Star Wars book for Nathan and a coloring book and colored pencils for Madison. 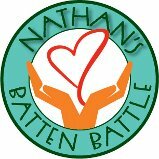 He even took time to visit with Nathan’s nurse Danielle. He told her she had a hard job but that it was rewarding. 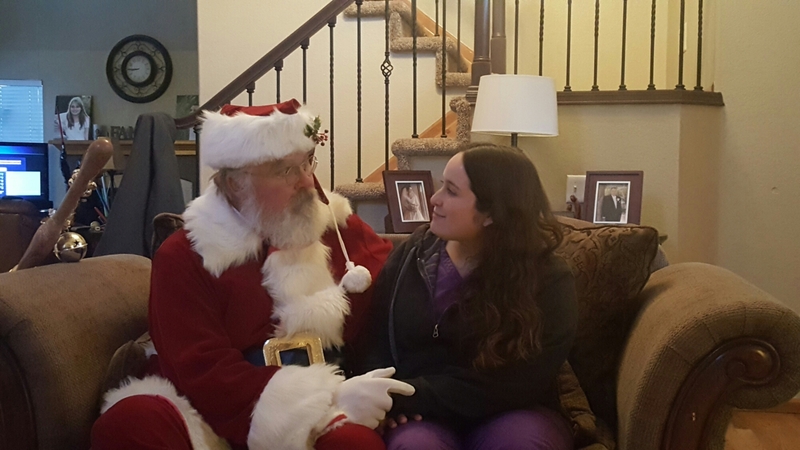 It may seem so simple to those who are able to take their children to visit Santa each year. I will say to us, these are treasured memories. We have happy memories because it was in an environment that was friendly to Nathan which makes everything better. 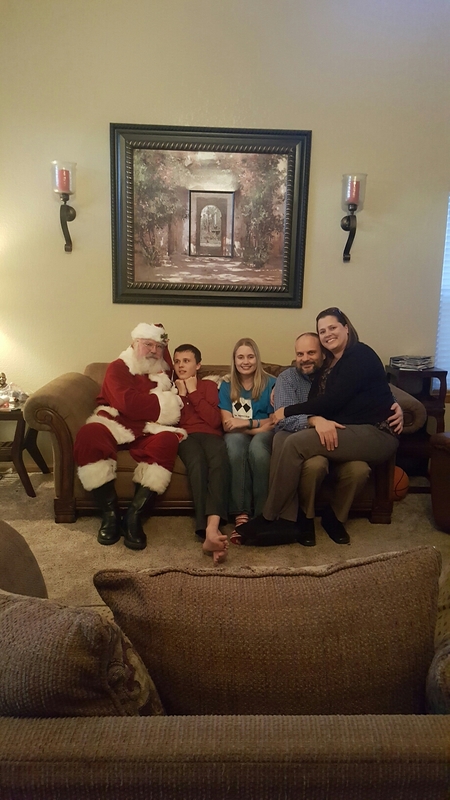 From the bottom of our hearts Santa, thanks for coming to visit our little family. Awesome!! Love this post!! Made me cry – Merry Christmas!! This is a Merry Christmas gift for your family and all of us that love you!!!! Beautiful!!! Saint Nicholas, aka, Santa Clause, thank you for bringing some very special love to my precious Hiltman family. You gave This sweet family a priceless gift. I know your heavenly source of inspiration made some important folks feel HIS love. Thank you. 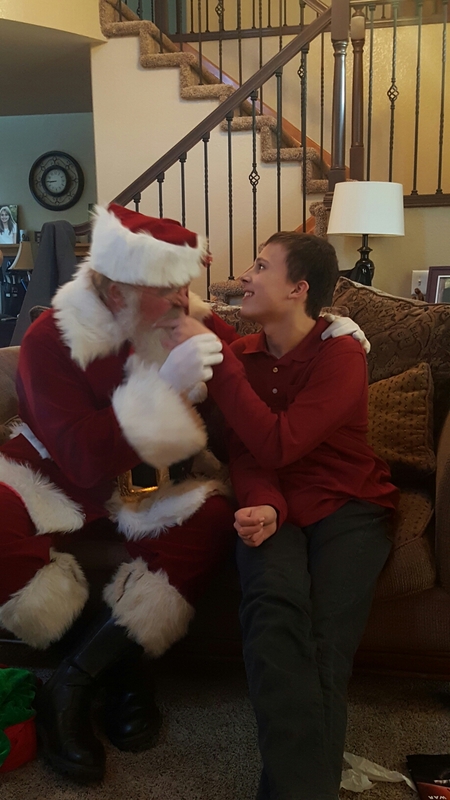 Ah the spirit of Christmas..what a wonderful gift….these are the moments we treasure..Blessings and Hugs and Merry Christmas…thanks so much for sharing this with all of us….prayers too…I will always believe!